First up, a Hosoda screening event! This will be at the Kadokawa Cinema Shinjuku, the same theater holding the Hosoda Film Festival. 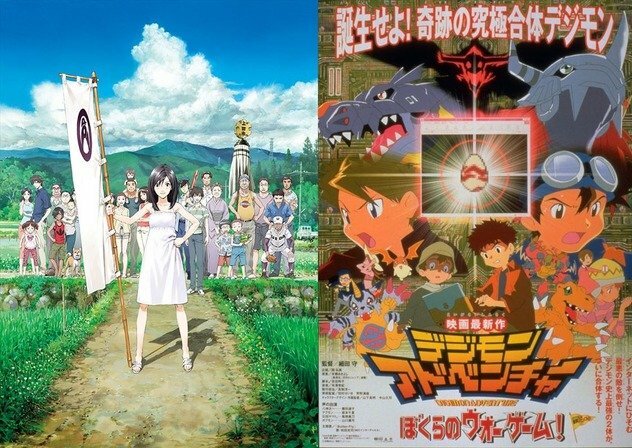 The screening event will consist of a screening of Digimon Adventure Our War Game and Summer Wars. Alongside the screening will be a mini-talk hosted by Yoshida Hisanori, an announcer from the Nippon Broadcasting System. He will be talking about the captivating parts and elements of Hosoda's works. They will also do a present lottery. The present given away will be a B2 size Summer Wars poster, that will sold exclusively at the theater. The one being given away at the event will be autographed by Hosoda. At the Jump Victory Carnival they will be giving away a Digimon Battle Spirits card. 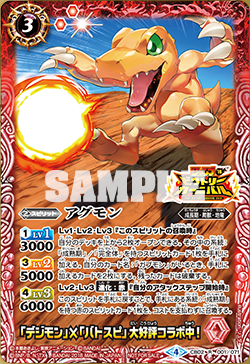 The card appears to be identical to the Agumon card that was released as part of the original Battle Spirit set (and re-released as part of the 1.5 set) but with Jump Victory Carnival branding. The first day of the Carnival is happening right now in Tokyo (Juy 16th), with the second day on July 22nd in Osaka. Summer Wars and Our War Game played back-to-back? That's kind of funny seeing as they're practically the same movie!